What if I told you that a 30-minute workout would bring you just as good or better results than a 60-minute workout? You would probably think I was crazy. I mean think about it, you are working out for 30 more minutes so you must get double the results right? Not according to a recent study. Denmark researchers found that 30-minute workouts produce nearly the same results as 60-minute workouts in terms of fat loss. Researchers were stunned to find out that the 60-minute group burned twice as many calories (600 calories per workout) as the 30-minute group (300 calories per workout), yet the 30-minute group still lost more fat! In short, researchers were stumped by their findings. They were expecting much better results in the 60-minute participants while they were not expecting the 30-minute group to do as well as they did, let alone burn more fat in half the time! First, you can clearly see that the myth of “the longer the better” is not always true. If you keep your workouts to 30 minutes and keep them intense, you will see great results. In the past we have discussed just how long workouts should last, so if you would like to revisit that article for more information, do so by clicking here! Second, during this study we do not know what kinds of workouts and exercises participants were put through. Most times researchers will stick to doing generic and machine style workouts during their studies because of limited resources. As we know, machines are not the best when looking to get fit. Could you imagine the results over this 13 week period if the participants had a professionally written program? The outcomes in these 13 weeks would have double, tripled, or even quadrupled in some cases! This is not to bash the study, because I do agree that you can get similar results in 30-minutes of time at the gym as compared to 60-minutes. What I am saying is if the participants would have been focusing on a program with incredible workouts, exercises, cardio circuits, and a solid nutrition plan their outcomes would have been much much better! => Click here for the workouts I WISH this study would have used! Finally, how it is that the 60-minute group burned DOUBLE the calories of the 30-minute group per workout, yet the 30-minute group still burned more fat? Let’s say you run on the treadmill for an hour and burn 400 calories during your workout. You are sweating and feel like you just got a great workout in, but once you step off that treadmill your calorie and fat burning stops. Yes, you will still burn the calories that you always do (from walking, standing, driving, etc.) but from the workout you just did, your caloric burn stopped at 400. Now let’s say you put yourself through a grueling 30-minute strength training circuit. From this workout you only burned 200 calories while at the gym. So what workout would you say burned more calories? The 60-minute one right? WRONG! 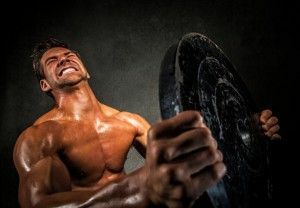 When you put yourself through an intense workout, your body will not only burn calories while at the gym but you will continue to burn fat and calories for hours after as well. In some cases, you can burn calories and fat for up to 48 hours from a single workout! That right there is the power of strength training, high intensity intervals, sprints, circuits, etc. By putting yourself through intense workouts, you may not burn as many calories while in the gym (although in some cases you will) but it is afterwards that you will continue to see elevated fat burn. Pretty sweet deal if you ask me. This is a fascinating study to prove once and for all that it is not about how much time you spend at the gym, it is about to quality of your workouts. If you focus on doing the right exercises, the right workouts, eat properly, and allow your body to recover you are bound to see an incredible change in your physique. And who wouldn’t want that in half the time? P.S. Like this post? Hit that ‘Like’ button before you go, it is always appreciated!